“This is not a set for the general collector or standard opera lover. However, for specialists who have an interest in the history of operatic singing this wonderfully produced compilation is a gold mine of vocal history. The earliest singer here (Leopoldo Signoretti) had a life span of 1840-1915, and the latest by birth date (Fiorello Giraud) was 1870-1920. For comparison, Verdi’s dates were 1813-1901, and Puccini’s 1858-1924. Every one of these singers was essentially a contemporary of Puccini, and only two of them (Francesco Signorini and Edoardo Garbin) lived beyond Puccini’s death. 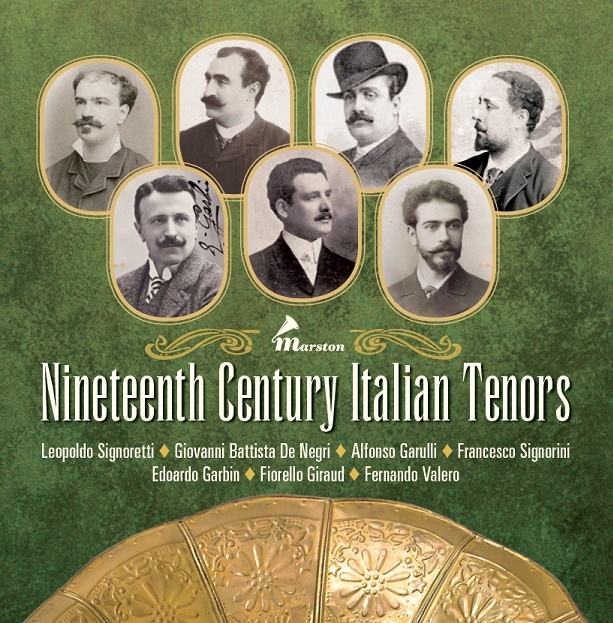 As a vivid example of a style of singing long gone, this compilation of pre-Caruso tenors gives us a clear view into an era that permitted, and perhaps even encouraged, a far greater degree of interpretive freedom than seems permissible today. The set avoids the most well-known of that generation (de Lucia, Anselmi, etc.) who have been well represented on disc, and gives us a group of important singers not as well-remembered. While not every one of these tenors sings at the highest level, all of them provide insights that come from the time and place where the music was composed, and many of them are truly fine vocalists. From Michael Aspinall’s superb notes we learn, for example, that Verdi thought that Giovanni Battista de Negri sang some parts of OTELLO better than Tamagno, the role’s creator. One can understand Verdi’s pleasure as one listens to de Negri’s two recordings of the final monologue and the earlier ‘Ora e per sempre addio’. In addition to sufficient strength, there is a lyrical beauty missing from the recordings we have of Tamagno. 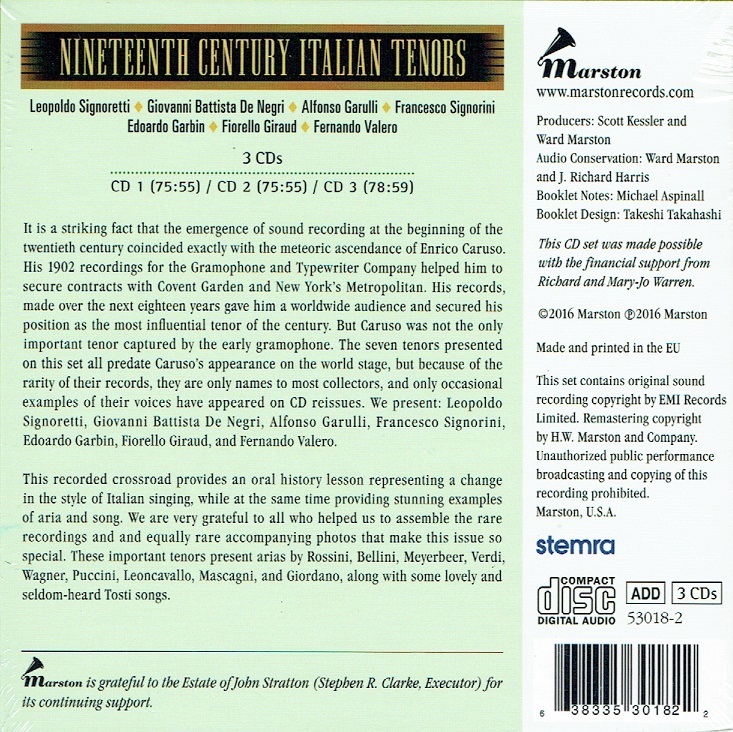 Even more satisfying are the ten recordings of Alfonso Garulli (1866-1915). His rendering of Lohengrin’s farewell to the swan is exquisite. Garulli was a lyric tenor with an innate sweetness to the tone and a great deal of imagination in the way he phrased and in his use of dynamic shading. He has the strength for a powerful ‘Vesti la giubba’, but his most memorable work is in his lyrical singing, including two lovely Tosti songs. Aspinall states that the famed Italian voice critic and scholar Rodolfo Celletti claimed that Caruso preferred Garulli to all his tenor contemporaries, and on the basis of his records here one can understand why. I will not review each singer in detail here, but there are some other highlights that must be pointed out. 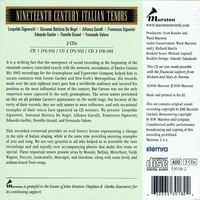 Two arias from Leoncavallo’s CHATTERTON, which come from a 1908 recording of the complete opera conducted by the composer, are strongly sung by Francesco Signorini. He was clearly a more dramatic tenor than many - his singing of arias from GUILLAUME TELL, LE PROPHÈTE, AÏDA, and IL TROVATORE demonstrates an ability to sustain long lines while maintaining tonal weight and heft. He may not have been imaginative, but he was impressive. Perhaps the most well-known of these singers is Edoardo Garbin (1865-1943). With 22 records reproduced here, he may be said to be the star of the set. Garbin was a true spinto, a tenor who combined the best qualities of lyric and dramatic singing. The flexibility and the imagination he displays in Turiddu’s drinking song is something we are unlikely to encounter in the opera house today, and some of us feel we are the poorer without it. Listening to Garbin, who knew and worked with the major composers of his time (he was the creator of the role of Fenton in Verdi’s FALSTAFF), we can surely believe that this kind of interpretive freedom was an expected part of the performance style. (We have strong documentation of that in a recording of an aria from ADRIANA LECOUVREUR made by Fernando de Lucia, stretched well beyond anything printed in the score, with all of those flights of interpretive fancy echoed by his accompanist - the composer Cilea himself)! There is in Garbin’s singing a liquid beauty, a sweetness of tone, an evenness of line, that bring real pleasure and reward re-hearing. Aspinall, in his candid notes, points out the shortcomings in Garbin’s singing: a lack of ‘that finishing touch of loving care for the music that distinguishes the greatest artists’. I suppose he is right in noting that de Lucia, Anselmi, and Caruso were more important singers, but I would give a lot to hear tenors today with the vocal beauty and stylistic imagination displayed by Garbin. His two duet recordings (from LA FORZA DEL DESTINO and LA BOHÈME) with baritone Mario Sammarco are absolute gems, with the two voices blending beautifully and each inspiring the other to shape more beautiful phrases. Overall, the combination of strength and grace in Garbin’s singing is a very winning combination. Another nice discovery for me was Fiorello Giraud (1870-1920), represented by 20 records here. Like Garbin, a spinto who managed well music ranging from Tannhäuser’s ‘Dir töne Lob’ to Toselli’s ‘Serenata’ and Godard’s lovely ‘Berceuse’ from JOCELYN. Giraud applied rubato generously but tastefully to everything he sang. Because he had a strong internal rhythmic pulse, the flexibility that he employed never broke the line of the music. His hushed beginning to Don José’s ‘Flower Song’ catches ones breath (though, as with most tenors, he ignores the soft dynamic of the aria’s final B-flat. Guiraud’s importance can be understood when we realize that Leoncavallo made a trip to hear him sing, and after that chose him for the premiere of PAGLIACCI in 1892 with Toscanini conducting. It seems a shame that he left no recordings of music from that opera, but it is lovely to have the generous quantity of songs by Tosti and others. Some might find his vibrato excessive, but it won’t disturb those who know other singers from that era (de Lucia, Bonci, and Anselmi, for instance). "The recordings by the glorious Fiorello Giraud are, alone, worth the price of this entire compilation! To have them available in such wonderfully bright and clear transfers is a generous gift to us all!"